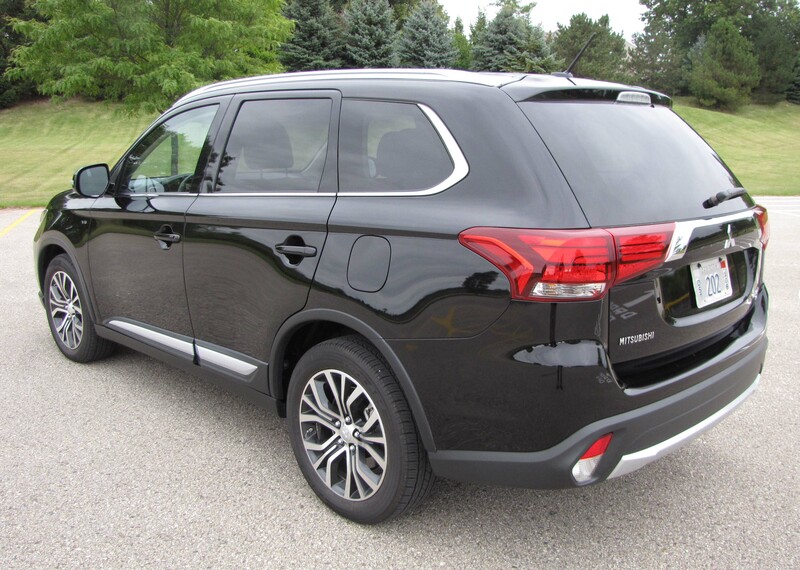 Outlander’s 3.0-liter, MIVEC V6 provides good acceleration at 224 horsepower and 215 ft.lbs. of torque. Not overly powerful, but strong enough to get on the highway with authority and the 6-speed automatic transmission shifts well too. 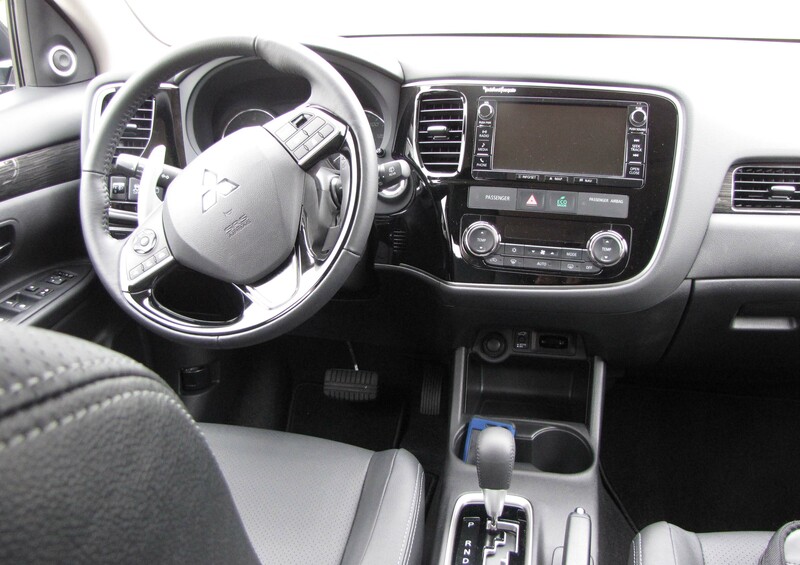 Outlander provides four drive modes and an Eco button to save fuel. The modes are Normal, Eco-AWC, Snow and Lock for full-time 4-wheeling. Normal was fine for city driving and I used it the most. Handling is good too, although not as responsive as say last week’s Hyundai Tucson or a Subaru Forester. 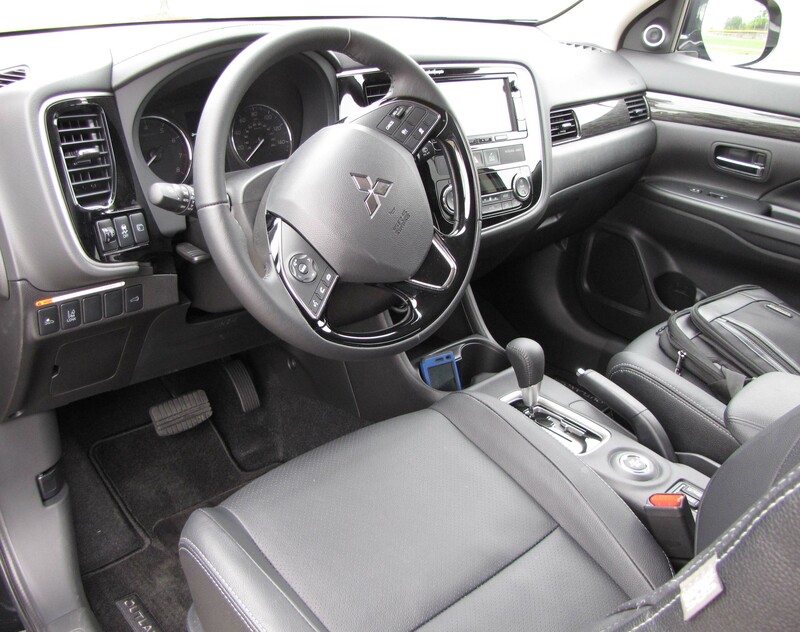 There is a bit of vagueness to the steering wheel, yet the small ute corners well and its AWD, which Mitsubishi calls Super All-Wheel-Control, or S-AWC, helps keep the vehicle well planted if the weather turns sloppy. 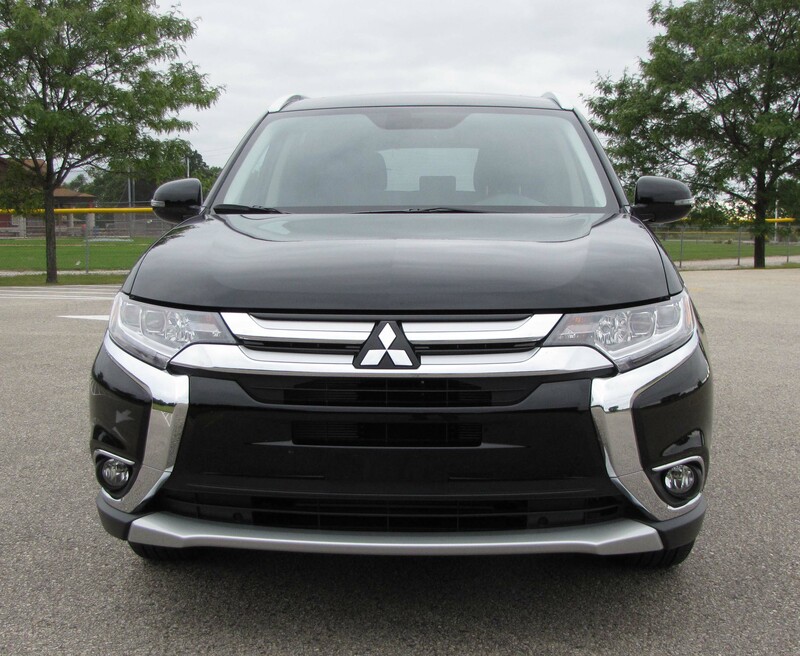 The Outlander is available in front-drive and AWD in its various trim levels. Ride is fine, but not as well controlled as in some other recently driven crossovers and utes. There is still the occasional bump that will get the driver’s attention and wake up any dozing passengers. 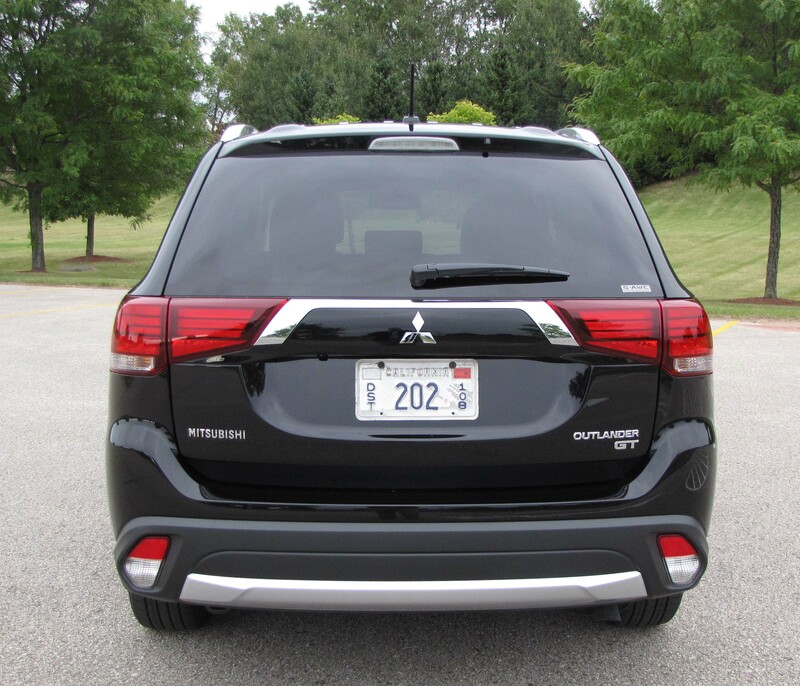 Outlander has a 105.1-inch wheelbase, right at the edge of the length where a smoother ride is nearly always assured. In my experience, 106 inches is the magic number for truly better ride. Braking is fine though with discs all around plus traction and stability control. Again, all this is what you expect from a compact ute/crossover. 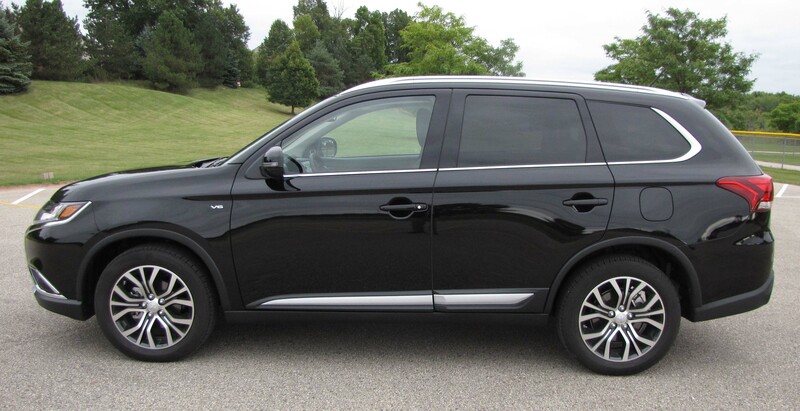 While Outlander’s wheelbase is the same as Hyundai’s Tucson, the Mitsubishi is much longer at 184.8 inches. That means more cargo room and more interior space, enough that Mitsubishi includes a fold-down third row seat. That can be a benefit if you have several nimble small children who could squeeze in back there. But legroom is quite limited and access is only meant for the young and agile. Both the second and third row seats split and fold down flat, the bottom cushion flipping forward first and the third row’s headrests needing to be taken off and stored in a cubby hole under the rear cargo floor. The headrests tend to slide just a bit in there and bump around, but folding a towel in the compartment would solve that. My concern is how flimsy the seat bottoms and backs feel when you fold them forward or down. Longevity could be an issue as these feel more like camping stools that fully supported and cushioned rear sport-ute seats. The front seats are fine and were black perforated leather in the test vehicle. Both front seats are powered, but the driver’s seat does not have a power lumbar support. Both front seats also are heated with two heat settings. 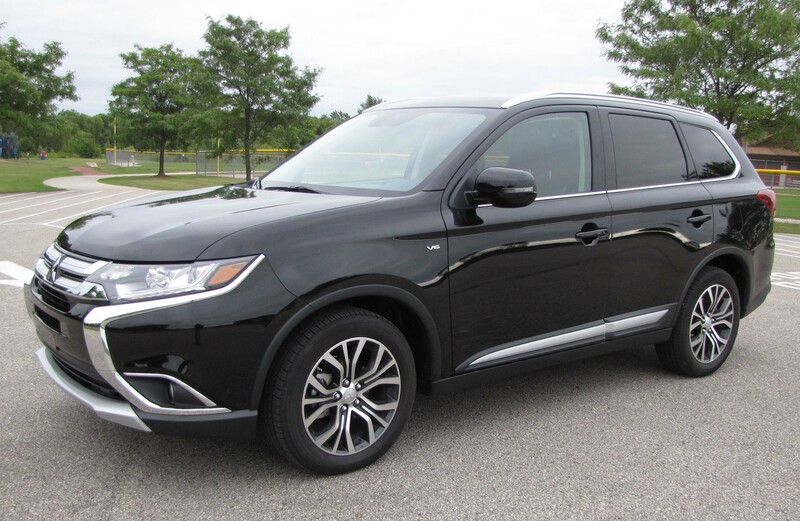 My test Outlander had a black dash with black gloss facing on the center stack, flat black trim by the main gauges and attractive black and silver striped trim that looks sort of like wood on the passenger’s dash and the doors. Overhead was a tan roof liner. The ute’s dash is well laid out with everything easy to see and understand although the radio/nav screen is a little smaller than those found in many vehicles these days. It’s not tiny, just a bit undersized. I like that the GT has dual climate controls, a power rear hatch and good-sized sunroof overhead, plus a rearview camera. Considering these upgrades, it seems odd that the sun visors did not slide though. The test vehicle added the GT Touring package that includes the navigation system, forward collision mitigation (beeps and brakes to avoid an accident), adaptive cruise control and a lane-departure system. If you want to disengage the latter, you must press a dash button every time you restart the vehicle. The package adds $3,350 to the Outlander’s cost. The GT lists at $30,095, a reasonable price for a well-equipped small ute with leather interior and AWD. With the option package and $850 delivery fee this one came in at $35,195. There are many utes and crossovers in this size and price range, so you’ll want to weigh all your options and compare what’s standard on each. Gas mileage was less than stellar, but this is powered by a V6, as opposed to the base model’s 2.4-liter I4 that creates 166 horses. That model, which starts about $23,800, also uses a continuously variable transmission, which aims to improve gas mileage. The I4 is rated 25 mpg city and 31 highway. However, on the V6 model I got 21.4 miles per gallon vs. the EPA estimate of 20 mpg city and 27 mpg highway. My driving was about 60% city. Oh, and the V6 prefers premium unleaded gas too. By comparison, a Nissan Rogue of similar size and weight got 25 mpg in my test earlier this year. Still, this is by far the best Mitsubishi I’ve ever driven and shows what a long way the automaker has come. It is on par with many small utes in style, comfort and functionality. I just wish it would have exceeded my expectations in some way. Hits: Pleasant looks inside and out, AWD, and good power and handling. GT has power hatch, 2-level seat heat, sunroof and rearview camera. Misses: No power lumbar support for driver’s seat, visors don’t slide, barely useable third row seats that are hard to access, plus flimsy fold down second- and third-row seats.